Featuring a powerful 6-cylinder and a high-quality interior, the aggressively styled Nissan Maxima is one of the best-handling front-wheel-drive cars available. 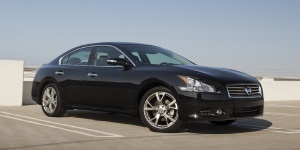 The 2012 Nissan Maxima gets a freshened grille and taillights, as well as updated interior trim. A new Limited Edition package for the 2012 Maxima upgrades over the base model with sportier exterior trim and premium features. Find the used Nissan Maxima of your choice from a dealer in your area. Search our used car listings now.